Below are the main topics that were discussed at the seminar. To obtain an in-depth training on each of these topics or talk to an expert directly, contact us now. 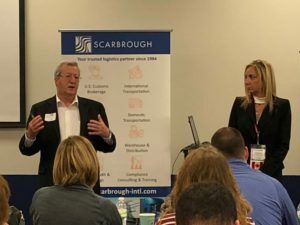 Adam Hill, Vice President of Scarbrough International, Ltd. and Scarbrough de Mexico S. de R. L. de C.V., which offer transportation and Customs brokerage services in the United States and Mexico, spoke about NAFTA documentation. He went through the physical certificate of origin document, explained each step in filling it out, and talked about what to do and what not to do. Kevin Ekstrand, Vice President of Sales and Marketing for Scarbrough International, Ltd. and Scarbrough de Mexico, had just flown in from another event centered around North American trade at the NASCO Continentnail Renuion in Monterrey, Mexico, where he sat on a panel discussing the updates of the NAFTA negotiations and what they meant for the U.S. 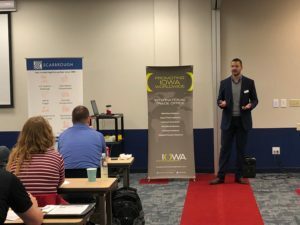 He brought that knowledge to the Iowa event and threw in some interesting census stats specific to Iowa and its main exports. Scarbrough’s close Canadian partners, Vice President and President of A.G.O Transportation and Action Customs Services, Sandra Faraj and Andre Goguen, were able to bring their local expertise into the heart of America, and spoke about the benefits of becoming a non resident importer in Canada, along with Goods and Services Tax (GST) and Harmonized Sales Tax (HST) taxes. A.G.O. Transportation has the same values as Scarbrough, and they always put the client first. Customer service is number one, and the organization will always ensure our clients are making the right decisions when it comes to selling to or buying from Canada. Who will be the importer of record? What is the anticipated volume (number of shipments into Canada)? Most U.S. companies who choose to become a non-resident importer will choose to voluntarily register for GST/HST and fall into the category of carrying on business outside of Canada since they regularly solicit orders for goods to be exported or delivered to Canada on a DDP basis. Should my company register? If your company anticipates having more than 2 shipments into Canada per year, where you are the U.S. Company are acting as the Importer of Record, yes, you should register. If you do NOT register, you cannot charge the GST, you cannot collect the GST, but you still have to pay the GST upon importation of the product. GST is a 5% tax assessed on most goods and sercices in Canada including all imports and is payable at time of importation. HST is part of the GST tax system, but is only applied to sales in certain provinces across Canada. The biggest takeaway from the Canada piece? Do not sell or ship to Canada prior to consulting with a specialist beforehand or you may end up with an expensive and unwanted surprise. There are several scenarios that come into play and it’s best to talk to talk to an expert before doing business in Canada. If you want to learn more about GST/HST or becoming a non-resident importer, don’t hesitate to ask us your questions or send us your scenarios. That’s what we are here for. To help make your job easier. Helpful Canadian links listed here. 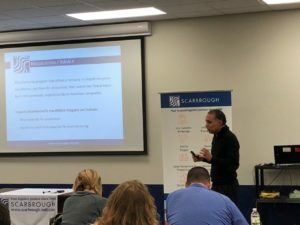 Scarbrough’s Southern Border Operations Manager, Samuel Camarillo, was also able to fly in from the Southern Border, bringing with him expertise when it comes to importing or exporting into or out of Mexico. Samuel, a former Mexican Customs agent, has several years of field experience and a wealth of knowledge pertaining to local Mexican companies, how to streamline North American trade processes between the U.S. and Mexican companies and was happy to share his knowledge with the crowd. Samuel explained the actual border crossing process both northbound and southbound along with the Mexican Customs regulations and complexities. One important thing to note on all southbound moves is the fact that every single southbound shipment must be hand inspected before it crosses the border. What does this mean? Freight forwarders and Customs brokers across the Southern border will physically take the freight into their warehouse, inspect it and ensure serial numbers match, the commodity is actually what the paperwork says it is, and ensure that the exporter is complying with Mexican regulations. Why is this so important? Because it could be mean jail time or hefty fines for the Mexican Customs Broker. Literally, the Mexican Licensed Customs broker, that individual that holds that license the Mexican company is importing through, could go to jail on behalf of your company if something isn’t right. It’s a big deal and we ensure we are not only taking care of our clients, but we are taking care of your clients and our people. Not only does Scarbrough have a large warehouse to store and inspect freight, but its capabilities to move the freight across the North America into each country, as well as provide Customs brokerage services in each country differentiates us from our competitors. Check out helpful Mexico links including process maps northbound and southbound. Scarbrough Vice President of Sales and Marketing, Kevin Ekstrand, just recently spoke on a panel at the NASCO Continental Reunion in Monterrey, Mexico, where keynote speaker Ildefonso Guajardo, Mexican secretary of the Economy, who leads Mexico’s NAFTA negotiation team was present. The theme of this year’s conference was Beyond Borders, Beyond Politics and drew government, educational, and business leaders from the United States, Canada, and Mexico. Kevin was able to bring some of that discussion back to Iowa, inform the crowd on changes that affect local businesses and update where the negotiations stand. The issues and objectives can be summarized in the following bullet points. More to come after results of the November 17th negotiations are released. The value of the program for the price was amazing. I appreciate the presenters from 3 countries. We are local in each country. We speak the language. We want to be your partner, not your vendor. And it is our job to make your job easier. We know there was a lot of information surrounded around NAFTA from the basics of acronyms and shipping processes to the complexities of regulations and documentation. Our team is here as a resource to you. We love questions and don’t mind setting up a one-on-one training in person or via online conference. Please note, we also have recorded training on our YouTube Channel and encourage you to subscribe. Check out our training division, Scarbrough University. Look for upcoming training and don’t be afraid to make suggestions. Please email Kim Taylor at ktaylor@scarbrough-intl.com to discuss any of the above.